We’re going local with our branding series this week. 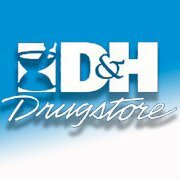 D&H Drugstore is on Facebook and Twitter. If weather forecasts are to be believed, temperatures befitting the Christmas season will finally visit Mid-Missouri this weekend. There’s much about this season that hasn’t felt just right. Driving with the windows down in December, while a pleasant experience, does nothing to prepare us for Christmas. Fortunately, there is one constant that people in Columbia can always count on to let them know the holiday season has finally arrived. D&H Drugstore‘s holiday ad on the radio; specifically on KFRU. D&H Drugstore has been a part of Columbia since time immemorial, and it seems as soon as Marconi (or Tesla, if you prefer) invented radio that ad began airing during the holidays. That is truly a testament to branding. When an entire city counts on you rather than Santa Claus to let them know Christmas is on the way, you’ve clearly done something right. It’s not just that holiday ad, though. Triston, Blaine, and the rest of the team have truly made D&H your family drugstore. Whichever location you go into, you know you’ll get prompt and friendly service that’s trying to solve whatever problem you have. Not sell you an expensive medication you may not need. If you need us, we’ll be humming D&H’s holiday ad while making some hot cocoa and stirring it with a peppermint stick.